To participate in your studies, people must first be able to find them. If you’re working to recruit people for research studies, you don’t need to manufacture an audience. They’re already out there. Some may hope a study will help them. Others may want to help a friend or relative, or just contribute to science. And it’s your job to convert their passion into participation. 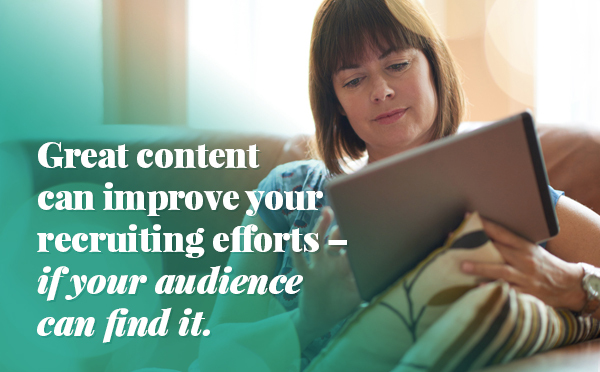 Great content can improve your recruiting efforts — but only if your audience can find it. That means you need your website to rank highly on search results pages. Search optimization, or SEO, can help you get the job done. The world of SEO is a complicated one. And developing good SEO takes time. But if you understand and employ a few basic principles, you can boost your recruiting efforts. It’s all about creating pages that play nice with web crawlers, the automated software tools used by search tools like Google. To be ranked highly in search, you need to make your pages easy for a web crawler to find. And you need to convince the crawler that your pages have value to an audience. Here are a few ways you can do both. Search engines place a premium on content that is useful. One way they measure usefulness is by tracking “stickiness” of pages. When people arrive at your study recruiting page, they scan it quickly. Is the content clear? Is useful information easy to find? If the answer is “yes,” they stick around. Web crawlers love the sticky. So how do you create sticky pages? Make pages scannable: Put important information in headlines and the first two paragraphs. Who is the study for? What does it hope to accomplish? When and where is it happening? Who can participate? How do they sign up? People look for the important stuff up front. So do search engines. Don’t bury the good stuff. Skip the jargon: Is your study landing page heavy on medical and research terms? If so, replace them with more conversational language. People don’t like jargon. Search engines don’t, either. Keep it brief: Long sentences (and paragraphs) drive readers away. Display numbers carefully: Make them easy to see — and to interpret. When you make your pages clear and useful, you make them stickier. Even better, people often link to sticky pages from other sites. When well-respected websites such as the New York Times and government agencies link to a research study page, web crawlers takes notice. Your search rank will rise, and you’ll get more organic traffic. Studies represent a great opportunity to get found online. You probably have a page where you list your studies. And individual studies likely have pages of their own. Your job is to make these pages easy to find. And this is where, if you’re not thorough, you might not succeed. Most study recruitment sites use internal or “on-page” search engines to help their visitors find studies. Using these internal engines, people can search by study type, study location, study date, or other criteria. That works great if people are already on your site. But it won’t help folks who are searching for studies using Google, Bing!, or Yahoo. To make your pages more crawler-friendly, use internal links. As a general rule, you should make sure that every page on your site can be found from a link on another page. When you do this, it’s much easier for search engines to find your studies. This should improve your search rank —and your traffic numbers. Since people often search for studies by location, you have to make sure your pages are easy to find using geographic search terms. One way to do this is by using title tags. The HTML title tag helps search tools understand a page’s content at a glance. On a page of Google search results, the title tag is the clickable blue text. Title tags also appear at the top of a browser window, on the page tab. In addition to title tags, you should also make sure that geographic information about a study appears on the page. Adding a Google Map will boost the page higher. You might also include the address in the page footer. All of this helps convince a web crawler that you’re providing value to your audience. And that’s what SEO is all about. Read from our collection of Health Study Recruitment Insights. Visit Provoc’s Health Study Recruitment Program to sign up by email, and learn more about innovations in health study recruitment. Culture Meets Data, A Love Story?